Raise your game to all new heights! 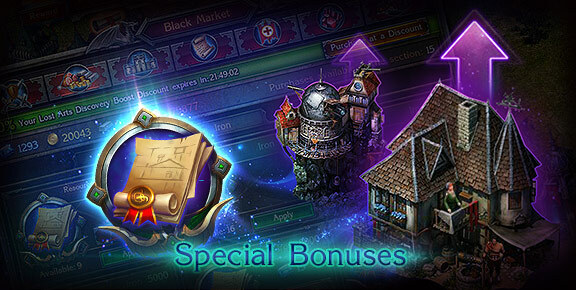 Lords and Ladies from across Darkshine are now eligible to receive even greater Bonuses! Simply Upgrade your Buildings to increase your Castle’s power and cause your rivals to tremble inside their gates! Level 25 – Max Warehouse capacity now 500,000! Level 25 – Max Barn capacity now 500,000! Now you can Upgrade your Eagle's Nest to Levels 21 and 22! Now you can Upgrade your Dungeons to Levels 6 and 7 to increase your Gold production! Upgrade now and gain an advantage over your rivals in your quest to rule Stormfall!